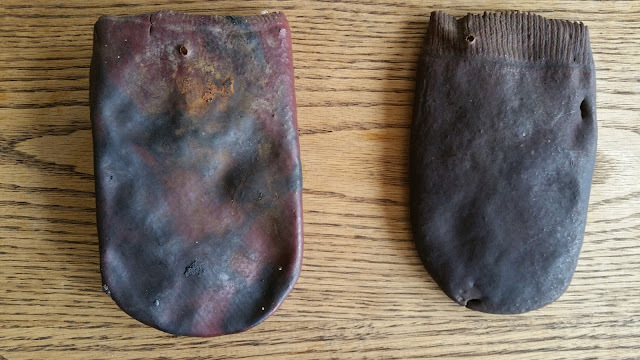 A few years ago, my father dug up two children's mitts on his land in Long Beach. I am trying to find out some historical information about the mitts - how old they are, etc. The mitts appear to be children's mitts as they are small. They are two different sizes. It appears that the mitts were dipped in some type of solution to make them waterproof - maybe linseed oil? The land where the mitts were found is now owned by my parents but it used to belong to my grandparents. When my parents took over the land, my grandparents' home was in bad shape and falling down so they had it bulldozed and buried on the land. We don't know if the mitts were in the house when it was bulldozed or not. My grandparents purchased the land and house in the '50s. The original owners of the land lived there from 1873-1961. 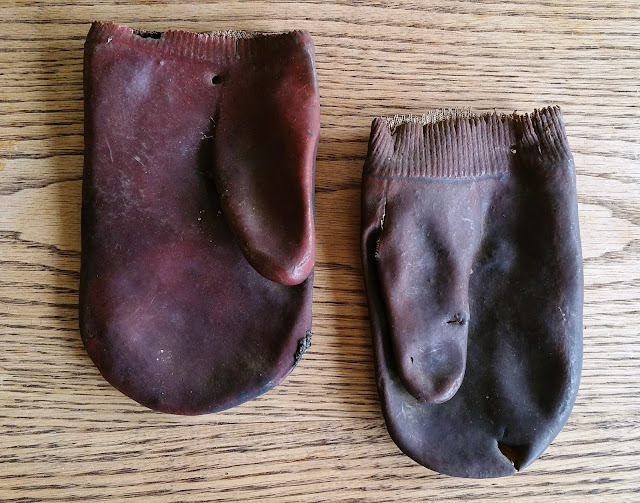 I asked my mother (who is 81) if she remembers seeing these mitts before but she does not. I also asked her brothers, who are a little younger than her, and they also do not remember them. Therefore I am thinking they belonged to the people who owned the house and land before my grandparents. When they sold the house to my grandparents, they left some belongings in a back room upstairs. These mitts may have been among their items. Have you seen or worn mitts like this? If you have, send me an email at ich@heritagefoundation.ca, or leave a comment below. This would be much more likely to be gutta percha or indiarubber than linseed oil, which tends to show more of the grain of the original fibres. I recall seeing an old pair of these as well when I was a kid rummaging around in the sheds we had. My father never threw away anything and there was a lot of stuff that probably dated back over a hundred years. Every now and then someone will post something on Facebook and right off I know I saw it before. Sadly after my parents had died we sold the property and what wasn't saved went to the dump...who knows what fabulous items were thrown away.